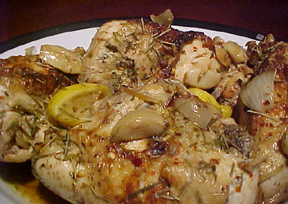 The lemon and herbs add a wonderful fragrance to this braised chicken; add a simple starch and roasted vegetable for a delicious fall dinner. 1 whole frying chicken, approx. 4 lbs. Preheat oven to 350. Rinse and pat chicken dry, inside and out. Drizzle with 3 Tbl. olive oil and balsamic vinegar. Squeeze lemon juice over, reserving hulls. Liberally season chicken, inside and out, with salt and pepper. Place lemon hulls, rosemary sprigs and the peeled, mashed garlic clove inside cavity. Heat 1 tbl. olive oil an ovenproof dutch oven with tight-fitting lid (it should be large enough to hold the chicken comfortably, but not too large) over medium heat. Slowly brown the chicken on all sides, starting breast side down, taking care not to lose the contents of the cavity. 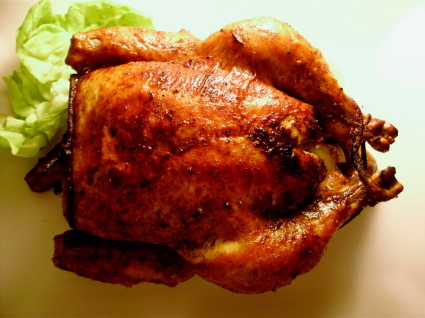 Use a spatula and wooden spoon to aid in turning the chicken. Add more olive oil as needed to prevent the chicken skin from burning. When finished, you should end up with the breast side up. Add unpeeled garlic cloves, onion and bay leaf to the pot. Pour wine over chicken. Add brown sugar to the liquid. Cover tightly and bake for thirty minutes. Uncover, and sprinkle with thyme and red pepper. Cover and bake an additional thirty minutes. Remove pot from oven and let rest, covered, for at least fifteen minutes. 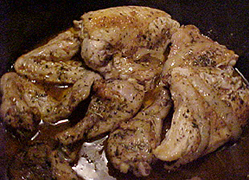 Remove chicken from pot and carve, or cut into serving pieces. Garnish this rustic dish with the braised garlic, rosemary and lemon hulls, or use fresh herb sprigs and fresh lemon slices for a more elegant presentation. 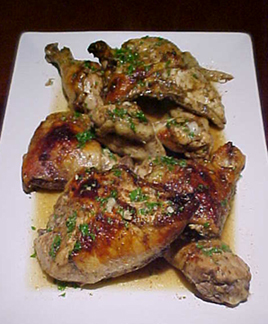 Defat pan juices and serve with the chicken. 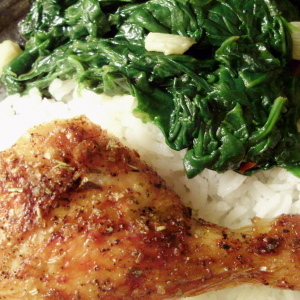 Perfect with rice or pasta.